Glycemic control aiming at normoglycemia, frequently referred to as 'strict glycemic control' (SGC), decreased mortality and morbidity of adult critically ill patients in two randomized controlled trials (RCTs). Five successive RCTs, however, failed to show benefit of SGC with one trial even reporting an unexpected higher mortality. Consequently, enthusiasm for the implementation of SGC has declined, hampering translation of SGC into daily ICU practice. In this manuscript we attempt to explain the variances in outcomes of the RCTs of SGC, and point out other limitations of the current literature on glycemic control in ICU patients. There are several alternative explanations for why the five negative RCTs showed no beneficial effects of SGC, apart from the possibility that SGC may indeed not benefit ICU patients. These include, but are not restricted to, variability in the performance of SGC, differences among trial designs, changes in standard of care, differences in timing (that is, initiation) of SGC, and the convergence between the intervention groups and control groups with respect to achieved blood glucose levels in the successive RCTs. Additional factors that may hamper translation of SGC into daily ICU practice include the feared risk of severe hypoglycemia, additional labor associated with SGC, and uncertainties about who the primarily responsible caregiver should be for the implementation of SGC. Strict glycemic control (SGC) decreased mortality and morbidity of ICU patients in two randomized controlled trials (RCTs) [1, 2]. Five successive RCTs, however, failed to show benefit of SGC [3–7], with one trial even suggesting SGC to cause harm since it was associated with an unexpected higher late mortality rate . After the publication of the first RCT on SGC , the ICU community seemed divided on the best method of glycemic control. On the one hand, study results were criticized: that is, it was suggested that the original study results lacked generalizability, at least in part because of the fact that it was a single-center study, and because patients frequently received parenteral calories, which was not common practice. On the other hand, several professional associations adopted the strategy by proposing guidelines, and it was stated that hyperglycemia should no longer be tolerated . As a consequence, many ICUs implemented some form of glycemic control, although frequently the applied regimens tolerated higher blood glucose levels than those used in the SGC strategy as studied in the original trial . After publication of the second RCT on SGC, which showed less strong though still significant benefits of SGC , the community continued to propagate glycemic control with insulin . Since the publication of five successive negative RCTs [3–7], however, enthusiasm for implementation of SGC has declined, hampering the translation of SGC into daily ICU practice. Apart from the influence of the negative RCTs, several other factors may hinder implementation of SGC. Fear of severe hypoglycemia hindered, at least in part, broad implementation of SGC . Also, SGC mandates frequent blood glucose measurements, which may be considered labor intensive. In addition, although SGC in the two positive RCTs was solely applied by ICU nurses [1, 2], it is often suggested that these caregivers lack sufficient background knowledge to safely apply SGC (in particular when aiming at the lower normal limits of blood glucose levels) . There are several alternative explanations for why the five negative RCTs of SGC showed no beneficial effects. In addition, risks of severe hypoglycemia should be rationalized. And also one may wonder whether SGC is really that labor intensive . In this manuscript we attempt to explain the variances in outcomes of the RCTs of SGC and discuss the limitations of the current literature. Critical illness-induced hyperglycemia was long believed a beneficial, adaptive response to provide those organs that predominantly rely on glucose as metabolic substrate (brain and blood cells) with additional energy. However, critical illness-induced hyperglycemia is also associated with adverse outcome [13–16]. Hyperglycemia has been suggested to be acutely toxic in critically ill patients because of accentuated cellular glucose overload and pronounced toxic side effects of glycolysis and oxidative phosphorylation . During severe illness, the expression of glucose transporters on the membranes of several cell types is upregulated, which during reperfusion after ischemia may allow high circulating glucose levels to overload and damage these cells. Besides cellular glucose overload, vulnerability to glucose toxicity may be due to increased generation of and/or deficient scavenging systems for reactive oxygen species produced by activated glycolysis and oxidative phosphorylation. In the context of threatened organ function due to critical illness, hyperglycemia-induced cellular injury could reflect a preventable risk. Establishing a causal relationship between hyperglycemia and adverse outcomes, however, requires RCTs to assess the impact of preventing and/or treating hyperglycemia in critically ill patients. Table 1 presents a summary of the RCTs reported to date on SGC. The first single-center RCT from Leuven showed SGC to significantly decrease mortality in surgical ICU patients (4.6% in the intervention group versus 8.0% in the control group) . SGC also reduced the incidence of bloodstream infections, acute renal failure requiring dialysis or hemofiltration, red-cell transfusions and critical illness polyneuropathy. In addition, SGC was associated with a shorter time of ventilatory support. The second single-center RCT from Leuven showed SGC to reduce morbidity, but not mortality in medical ICU patients . Of note, the power analysis for this trial was based on the number of patients requiring ≥3 days of stay in the ICU. Since the trial recruited only 767 patients who stayed ≥3 days in the ICU, and not 1,200 patients as calculated in the power analysis, this trial was not powered to detect a difference in mortality in the intention to treat population. However, while no impact on in-hospital mortality was found in the intention to treat analysis (37.3% in the intervention group versus 40.0% in the control group), a per protocol analysis of patients who stayed in the ICU ≥3 days did show a difference in mortality (43.0% in the intervention group versus 52.5% in the control group). Do results support the use of SGC? A Saudi Arabian single-center RCT revealed no significant difference in ICU mortality (13.5% in the intervention group versus 17.1% in the control group) . Also, after adjustment for baseline characteristics, SGC was not associated with a mortality difference. In a Colombian single-center RCT, 28-day mortality rate was not affected by SGC (36.6% in the intervention group versus 32.4% in the control group) . Also, ICU mortality was not different between study groups in this trial. A German multi-center RCT, in which patients with severe sepsis were randomly assigned to receive either SGC or conventional therapy and either 10% pentastarch, a low molecular weight hydroxyethyl starch, or modified Ringer's lactate for fluid resuscitation, was stopped prematurely for safety reasons (increased incidence of severe hypoglycemia with SGC, higher rates of acute renal failure and need for renal-replacement therapy with pentastarch) . At 28 and 90 days, there was neither a difference in mortality (24.7% and 39.7% in the intervention group versus 26.0% and 35.4% in the control group), nor a difference in the mean score for organ failure between the study groups. In a RCT from Australia/New Zealand and Canada, unexpectedly, 90-day mortality was even higher with SGC (27.5% in the intervention group versus 24.9% in the control group) . There were no differences between the intervention group and the control group in the median number of days in the ICU or hospital, or the median number of days of mechanical ventilation or renal replacement therapy. Finally, a multi-center RCT from Europe (Austria, Belgium, Spain, France, Italy, Slovenia, and the Netherlands) and Israel, which was stopped prematurely because of lack of difference regarding blood glucose control, again SGC was not associated with mortality reduction (15.3% in the intervention group versus 17.2% in the control group) . Two meta-analyses, of which the first included the first five RCTs , and the second all trials except the last RCT , showed SGC not to be associated with significantly reduced hospital mortality. However, different primary outcome measures were used in the successive RCTs (that is, 28-day mortality, 90-day mortality, ICU mortality and/or hospital mortality). This is not a trivial comment, since, for instance, discharge criteria and follow-up beyond ICU and hospital discharge may vary and, as such, may have affected outcome. This makes correct interpretation of the meta-analyses difficult, if not impossible. There are several alternative explanations for why the five negative RCTs do not show beneficial effects of SGC, apart from the possibility that SGC may indeed not benefit ICU patients. These include, but are not restricted to, variability in the performance of SGC, differences between trial designs, changes in standard of care, differences in timing (that is, initiation) of SGC, and the convergence between the intervention groups and control groups with respect to achieved blood glucose levels in the successive RCTs. SGC may seem an easy to implement strategy, but there are several aspects of SGC that might be important and are frequently overlooked . Indeed, SGC is a complex intervention that involves several sequential steps that may all contain potential sources of variability (Figure 1). Methodological aspects of strict glycemic control, which may contain potential sources of variability in the performance of this strategy. Items are categorized into the following subjects: 'monitoring', 'insulin delivery', 'algorithm', and 'experience'. Items are also roughly positioned on a line from 'easy', 'simple', 'distinct' and/or 'clear' to implement towards 'obscure', 'indistinct', 'complex' and/or 'difficult' to translate from one center to another. Specific elements per item indicated with an asterisk are as performed in the single-center RCTs from Leuven. SGC, strict glycemic control. In the two positive RCTs from Leuven, ICU nurses were using accurate blood gas analyzers to measure blood glucose in arterial blood at strict time points, and in between those time points whenever deemed necessary. Notably, in the second RCT from Leuven a variety of glucose analyzers were used, not just blood gas analyzers. SGC comprised a reliable continuous infusion of insulin exclusively via a central venous line, using accurate syringe-driven infusion pumps. Delicate insulin dose adaptations were to be performed exclusively by ICU nurses who were especially trained to implement this complex strategy (that is, executing insulin dose adaptations), while based on a guideline, aiming for blood glucose levels close to the lower normal limit, and also requiring a high level of intuitive decision making. And, finally, patients were kept in a non-fasting state at all times - glucose was administered on the first day, and thereafter balanced enteral nutrition, supplemented where needed by parenteral nutrition, was provided during the entire stay in the ICU. Several of the above mentioned methodological aspects of SGC often diverged substantially in successive RCTs. Indeed, blood glucose levels could be checked using capillary whole blood samples, using less accurate glucose analyzers [3–7]. Notably, this was also the case in the second RCT from Leuven - this may be one of the reasons that the rate of severe hypoglycemia was so much higher in this trial. Instead of accurate syringe-driven infusion pumps, volumetric infusion pumps could be, or were exclusively, used [3, 4], or this was not mentioned . Also, training of ICU nurses in the guideline was either not mentioned (and thus possibly not done in a structured way) [5, 7], or seemed to be restricted to training related more to the prevention and correction of hypoglycemia . It was either not stated whether ICU nurses exclusively titrated insulin, or it was stated that both ICU nurses and ICU physicians decided on insulin dose adaptations , which may be inappropriate. And finally, glucose administration on the first day was frequently not mentioned and thus probably not a part of the protocol [3, 5, 7]. Most challenging in this context, however, is the 'expertise-based control system' as applied by the ICU nurses from Leuven. While the algorithm from Leuven contains no more than a set of simple rules (that is, there is an absence of explicit rules, such as present in closed-loop systems, computer-based decision support systems, and paper-based systems using sliding scales), it required a high level of intuitive decision making by its users. It is difficult, if not impossible, to identify the specific elements of this 'intuitive control system' that contributed to the outcome observed in the trials from Leuven. The same may apply for the skill and motivation of ICU nurses from Leuven. Their talent in implementing SGC, as well as motivation to apply it, may very well not have been copied in trials beyond their ICU. In this context it is important to note that the interventional arms of some of the multi-center RCTs contained very low numbers of patients. For instance, the German multi-center RCT included 247 patients from 18 centers, which means that only 14 patients were in the interventional arm of the study in each center . A similar calculation for the European multi-center RCT suggests that only 26 patients from each center were in the interventional arm . It can also be questioned whether the practitioners in these trials were truly skilled in SGC. We consider all these differences from the two positive RCTs to be potentially responsible, at least in part, for the diverse outcomes of the five negative RCTs. As indicated in Figure 1, methodological aspects of SGC can be scored from relatively 'easy', 'simple', 'distinct' and/or 'clear' to 'obscure', 'indistinct', 'complex' and/or 'difficult' with regard to translation from one ICU (or study) to another ICU (or study). 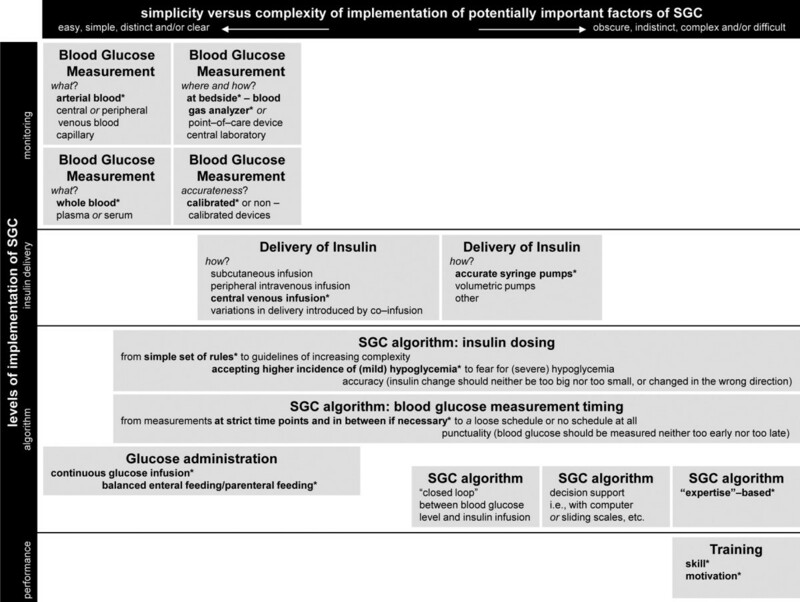 For example, decisions on blood glucose monitoring are easily made, simple, distinct and clear; whereas an intuitive control system for SGC is obscure, indistinct, very complex and difficult, if not impossible to translate into another setting. All other aspects can be scored in between these extremes. One issue with the three smaller RCTs is that they were all statistically underpowered to detect a reasonable mortality difference [3–5]. Especially the early termination of the German study was rather inopportune : while this study performed best in the intervention group, with blood glucose levels closer to the upper limit of SGC than the other negative trials, the study protocol allowed for early termination because of safety. The increase in the incidence of severe hypoglycemia forced the investigators to stop the study, leaving us with under-powered trial results. Although the last RCT specifically addressed the issue of statistical power, this trial was possibly also underpowered, as outlined below. Glycemic control has changed over the past decade. A policy of insulin therapy to target lower blood glucose levels has been adopted in many ICUs since the publication of the first RCT of SGC . Accordingly, SGC was compared with distinct 'control' targets (Figure 2). Indeed, in all the trials except for two, glycemic control had improved in the control group when compared to the first RCT. In addition, an increase was noticed in the number of patients who received insulin, or there was an increase in the amount of infused insulin in the control group [2–7]. This diversity makes the successive trials fundamentally different from the first RCT. Indeed, these RCTs were executed in the 'flattened' part of the observed blood glucose level-mortality risk curve . The hypothesized effect size in the last two RCTs [6, 7] (3 to 4% absolute reduction in risk of death, similar to what was observed in the original two RCTs [1, 2]) was, therefore, too optimistic: according to the pooled analysis of the original two RCTs , the absolute reduction in mortality that could have been expected from further lowering blood glucose levels compared to the standard care level was only roughly 1%. This would mean that tens of thousands of patients would be needed to show this effect in a multi-center setting (and not thousands of patients, as in the RCT from Australia/New Zealand and Canada ). Blood glucose levels (mean or median in the control or conventional group (closed bars) and strict glycemic control group (open bars) of seven randomized controlled trials. Original single-center randomized controlled trials (RCTs) from Leuven [1, 2]; single-center RCTs [3, 4]; multi-center RCTs [5–7]. Dotted lines indicate the blood glucose levels in the two original single-center RCTs from Leuven. In most trials time till reaching the preset blood glucose level target is insufficiently reported. When time till target is too long, the time window for prevention of toxicity of hyperglycemia may have passed and irreversible damage may already have occurred . This phenomenon has also been suggested by the pooled analysis of the two original RCTs . The time lag between onset of hyperglycemia (which is usually present on admission to ICU) and the time that blood glucose levels are within the target range may depend on several factors, including a delay in identifying eligible patients, randomization and initiation of SGC, the SGC algorithm itself, and the quality of its implementation. All these factors could be an issue of study design. Of note, for one RCT we can conclude this to be an important factor, as initiation of SGC in that trial was delayed by more than 13 hours because of randomization . It is notable that none of the RCTs completed after the two original trials managed to achieve the strict degree of glycemic control achieved by the Leuven investigators [1, 2]. Indeed, no trial had a median or mean blood glucose level in the intervention group below the upper normal target of blood glucose (Figure 2). Of note, one meta-analysis suggests that studies that managed to achieve the blood glucose target showed a reduced mortality whereas studies that did not succeed in reaching the target reported no benefit or even an increased mortality . This finding underlines that SGC, though basically simple, is not an easy to implement strategy. Other, yet uncertain factors may explain the divergent trial results, for instance, the variability of blood glucose levels. SGC algorithms, if properly applied, should decrease both the mean blood glucose level and its variability. Recent studies showed significant associations between variability of blood glucose levels and patient outcomes [23–25]. From personal experience we know that implementation of SGC takes considerable time. 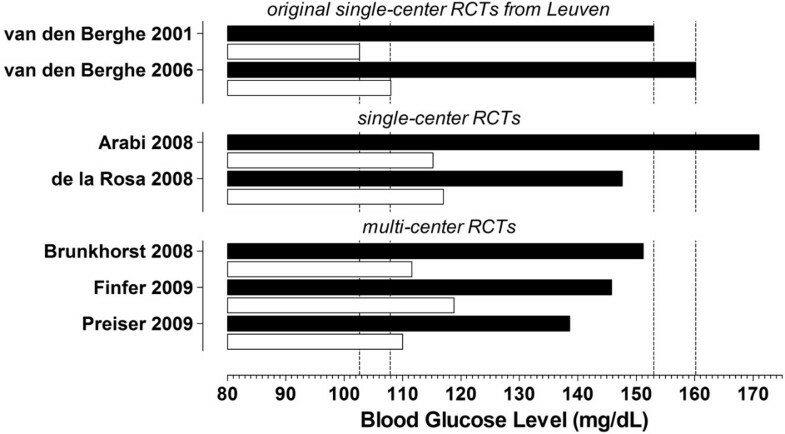 Variability of blood glucose levels in the multi-center RCTs, therefore, is not unlikely as some ICUs in these trials must have recruited only a limited number of patients [5–7]. Variability of blood glucose levels has neither been studied and reported nor compared between the RCTs. Many other metrics of successful glycemic control exist, but were neither measured nor compared among the RCTs . Severe hypoglycemia is a feared complication of SGC. Undoubtedly, with implementation of SGC the incidence of severe hypoglycemia increases. Reported incidences of severe hypoglycemia (blood glucose level <40 mg/dl) rise by five- to ten-fold compared to conventional blood glucose control in RCTs (Table 1). Neuroglycopenia may cause cerebral damage, epileptic insults or even coma . However, how deep does hypoglycemia need to be, and how long its duration, to cause these effects ? In the former century, repeated episodes of insulin-induced hypoglycemic coma for periods ranging from 45 minutes to 3 hours for the treatment of opiate addiction and schizophrenia have been found to have minimal long-term effects and a mortality of less than 1% . In addition, long-term follow up of patients with diabetes mellitus in large prospective trials failed to detect any association between the frequency of severe hypoglycemia and cognitive decline [30, 31]. Only subtle, reversible impairments of attention could be detected in non-diabetic patients undergoing dynamic pituitary function assessment using hypoglycemic stress with blood glucose levels of 29 mg/dl . At present we cannot conclude with certainty that severe hypoglycemia with SGC harms critically ill patients. Two retrospective studies identified (severe) hypoglycemia as an independent predictor of mortality [13, 33]. However, 30% of patients with severe hypoglycemia in one of the above cited retrospective studies were not on insulin therapy in the preceding 12 hours, and only a minority of patients was on intravenous insulin therapy . Therefore, this study hardly offers an answer to the question of whether severe hypoglycemia with SGC influences outcome. Similar problems exist with the interpretation of the results from the other retrospective study, in which the impact of early (that is, <24 hours after admission) hypoglycemia (not severe hypoglycemia) was studied. First, the occurrence of hypoglycemia may very well relate to severity of disease on admission. Second, the studied ICUs did not apply SGC . Nevertheless, multivariable regression analysis of the second RCT of SGC in Leuven confirmed that severe hypoglycemia was independently associated with mortality, and may have diminished the benefit of the intervention . Of interest, one experiment performed in rodents showed that brain damage was not associated with the duration of severe hypoglycemia, but instead with its correction with intravenous dextrose, causing formation of radicals . Indeed, brain damage correlated to the concentration and amount of dextrose used to correct severe hypoglycemia. Hypothetically, in practice, bolus glucose reperfusion of the depleted brain may cause more damage then the period of severe hypoglycemia itself. Finally, rapid administration of concentrated glucose solution for the correction of hypoglycemia may cause dangerous arrhythmias, potentially via hyperkalemia from the rapid administration of a concentrated glucose solution . Which caregiver should be responsible for the implementation of SGC? One final question on SGC concerns who should be responsible for its implementation in daily practice? In the hospital where the two positive RCTs of SGC were performed, without doubt SGC was (and still is) a completely nurse-driven strategy without the interference of ICU physicians, who are not at the bedside as frequently as ICU nurses . Although several arguments plea for SGC being a nurse-driven strategy, one could argue that ICU nurses lack sufficient background information to safely apply this strategy, especially when blood glucose control aims at the lower limits of normoglycemia (that is, with an increased risk of severe hypoglycemia). Of similar importance may be the fact that ICU nurses may feel legally unprotected when applying SGC . However, a nested case-control study revealed that many of the predisposing factors for hypo-glycemia in ICU patients were in fact easy to recognize . Predisposing factors included decreases of nutrition without adjustment for insulin infusion, sepsis, and changes in inotropic support. These are all earlier and better recognized by bedside ICU nurses than by ICU physicians taking care of many patients at the same time. We cannot be certain whether inadequacies in performing safe (that is, preventing severe hypoglycemia) and effective (that is, achieving the target) SGC is an important factor in explaining the differences between the positive and negative RCTs. However, as pointed out above, studies suggest that blood glucose variability does have an impact on outcome . One advantage of nurse-driven SGC may be that there is less blood glucose variability, since ICU nurses can respond earlier to changes in the blood glucose level, and since ICU nurses can titrate insulin without the interference of ICU physicians, who are not at the bedside as frequently as ICU nurses. During critical illness, glucose should not be seen as an innocent bystander. Indeed, lowering blood glucose levels has the potential to prevent injury to already threatened vital organs. However, the optimum level as well as the optimal mode to reach that level still needs to be defined. The observations that SGC exerted both positive [1, 2] and negative effects  poses a fascinating impasse. Of course, it should be recognized that the single-center RCTs may have suffered from several drawbacks. First, known, unknown and/or unrecognized differences between study settings may obstruct generalizability of results. Second, motivational effects of investigators can never be ruled out, in particular when investigators cannot be blinded. Such factors all apply to the single-center trials on SGC. However, one may also argue from a methodological standpoint that the single-center design of the two original RCTs was preferable. It could be difficult, if not impossible, to identify all important factors of this complex intervention that contributed to the outcome as observed in the RCTs from Leuven. In particular, poorly identified factors, as discussed above, may not have been transferred to other ICUs. However, as such, the two original RCTs, as well as a third positive RCT of SGC in pediatric patients from the same investigators , remain to have internal validity but fail to have external validity. Nevertheless, rather than concluding that SGC does not benefit critically ill patients based on the successive negative RCTs in other ICUs, we prefer first to search for differences between the designs of the positive and negative RCTs. There are several possible ways to go from here. We could accept the lack of evidence on the optimum level of glycemic control. The currently available evidence from the seven RCTs does not allow us to confidently make an overall recommendation. Indeed, the question of one optimal target for glycemic control in ICU patients remains unanswered. Consequently, any advice remains pragmatic: assess whether the hypothesized benefit was realistic, assess whether statistical power was sufficient, assess the level of evidence of the studies, assess whether the tools to measure and control blood glucose were adequate, assess whether the targets were achieved, and finally assess whether the levels of glycemic control diverged relevantly. Clinicians should also determine how comparable the patients in the different RCTs are to their own and decide on what is their best target for glycemic control. Alternatively, we perform another RCT, using the same targets as in the positive RCTs [1, 2], both for the interventional and the control groups. This, however, may be unethical if not impossible for several reasons. First, standard of care regarding glycemic control has definitely changed over the past decade (that is, can we speak of 'conventional' therapy when targeting a higher threshold than commonly applied?). How to explain that we should perform a new trial in which we deliberately expose critically ill patients to the risks of hyperglycemia? On the other hand, one may say that the negative trials on SGC did not show that mild hyperglycemia harmed ICU patients (although in most trials hyperglycemia was less severe than in the two positive RCTs). However, one could also posit that it is unethical to discard the evidence from the two positive RCTs, and we are obliged to repeat this study. Given the substantial evidence for the generation of harm from hyperglycemia [13–16] and the conflicting results from the seven RCTs [1–7], considerable work remains to be done in identifying the confounding factors in the clinical application of SGC. This process needs to be explicit and systematic, and should at least include the points raised in this commentary. An individual patient data meta-analysis examining the discrepancies between studies may be a good start. If new RCTs are to be performed, investigators should recognize the several shortcomings of the recent negative trials, as previously described. Most important, glucose levels in the intervention groups in any new trials should indeed reach targets between 80 and 110 mg/dl. Perhaps one other step in this field of ICU medicine will involve the next generation of (continuous or near-continuous) glucose monitors and treatment algorithm technology . These may reduce the incidence of severe hypoglycemia, glycemic variability and the nursing work burden. What should those caregivers do who want to implement this strategy? As outlined above, key aspects of SGC should be recognized: accurate blood gas analyzers to measure blood glucose in arterial blood at strict time points; reliable continuous infusion of insulin exclusively via a central venous line; accurate syringe-driven infusion pumps; insulin dose-adaptations performed exclusively by specially trained ICU nurses, with high levels of intuitive decision making; and non-fasting state at all times. Results from animal studies point us to potential risks associated with overcorrection of severe hypoglycemia. While SGC decreased mortality and morbidity of adult critically ill patients in two RCTs, five successive RCTs failed to show a benefit of this strategy, with one trial even reporting unexpected higher mortality. There are several alternative explanations for the five negative RCTs that showed no beneficial effects of SGC, apart from the possibility that SGC may indeed not benefit critically ill patients. The currently available evidence from the seven RCTs, however, does not allow us to confidently make an overall recommendation regarding glycemic control. Clinicians should determine how comparable the patients in the different RCTs are to their own and decide on what is their best target for glycemic control. More RCT evidence is needed, but it is questionable whether there will ever be a new trial using the same targets as in the original RCTs. MJS searched the literature, interpreted the results and drafted the manuscript. REH participated in drafting and reviewing the manuscript. PS participated in drafting the manuscript. All authors approved the final version of the manuscript.